The submarine HMS Gotland recently launched their test sortie to carry out the tests that can only be done at sea. FMV performs the trials to see if the onboard systems deliver the capabilities they should. The Gotland submarines, built between 1990 and 1997, have previously undergone simpler modifications. The mid-life upgrade that is now being carried out takes a holistic approach and looks over the entire submarine and its installations to ensure demand availability and performance for remaining life. Systems and equipment that are outdated and deemed difficult to keep in operation during the remaining lifetime are upgraded or replaced. In connection with this, the need to update the submarine's existing abilities to meet new threat pictures has also been evaluated. Furthermore, the mid-life upgrade modifications also deal with meeting the work environment and safety requirements that have changed since the submarines were built. The hulls of the submarines have been cut and extended by about two meters. The modification work on the inside has been significantly facilitated by working with free access through the submarine subdivision. On Friday October 19 His Swedish Majesty Ship (HSwMS) Gotland started its sea trials at the Saab shipyard in Karlskrona, after a comprehensive Mid-Life Upgrade (MLU) to ensure its operational service to Sweden beyond 2025. 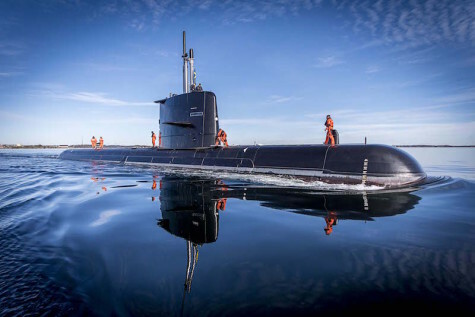 HSwMS Gotland is the first of two submarines being upgraded with the mid-life modifications, which consist of upgrades of onboard systems and technology, sustaining the submarine’s operational capability to meet future naval challenges. “The sea trials mark an important phase in the MLU project. This is the first time the crew will be able to operate the new systems in the true environment. After extensive training in the land-based training facility, they will now be able to see the true potential of their submarine,” says Gunnar Wieslander, Senior Vice President, head of business area Kockums at Saab. The upgrade process entails many important systems, such as the Stirling Air Independent Propulsion (AIP) for longer duration underwater and the combat system. Even the traditional optical periscope is replaced with a new optronic mast for enhanced surveillance. More than 20 systems on-board the upgraded Gotland-class will be implemented in the new A26 submarine for Sweden. The Gotland MLU therefore contributes to the test and qualification of some of the innovative solutions to be implemented in the future Swedish A26 submarines. After tests and verifications, the submarine will be delivered back to the Swedish Navy.